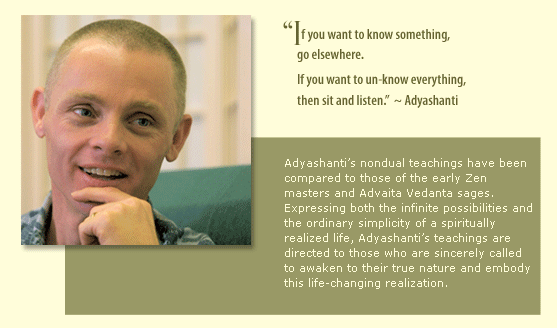 Adyashanti from California, have a lot of identity that can be associated with him. He is an inspirational teacher, author, zen practitioner. But above all he is a blessed soul present in our very time. His name, "Adyashanti" means primordial peace. The author of Emptiness Dancing, The Impact of Awakening, and My Secret is Silence, Adyashanti offers spontaneous and direct nondual teachings that have been compared to those of the early Zen masters and Advaita Vedanta sages. However, Adya says, "If you filter my words through any tradition or '-ism', you will miss altogether what I am saying. The liberating truth is not static; it is alive. It cannot be put into concepts and be understood by the mind. The truth lies beyond all forms of conceptual fundamentalism. What you are is the beyond—awake and present, here and now already. I am simply helping you to realize that." 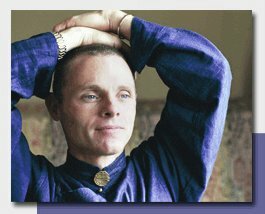 A native of Northern California, Adyashanti lives with his wife, Annie, and teaches extensively in the San Francisco Bay Area. He also travels to teach in other areas of the United States and Canada. Ref: http://www.adyashanti.org/. Visit his website for teachings, his talks and videos.